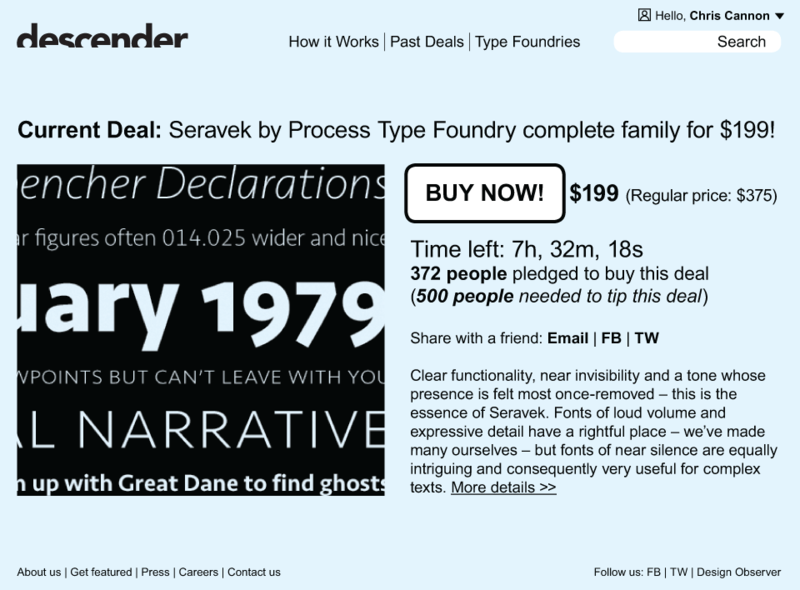 A minimum viable product for a service that brings together typeface buyers and typeface foundries for mutual benefit. This course’s objective was to get designers to think like entrepreneurs and use the skills we already possess to bring a successful product or service to market and create engaging user experiences. This process entailed inventing a product, testing it, and rapidly iterating it. Through this, we would develop a Minimal Viable Product, one with just those features (and no more) that allows the product to be used. 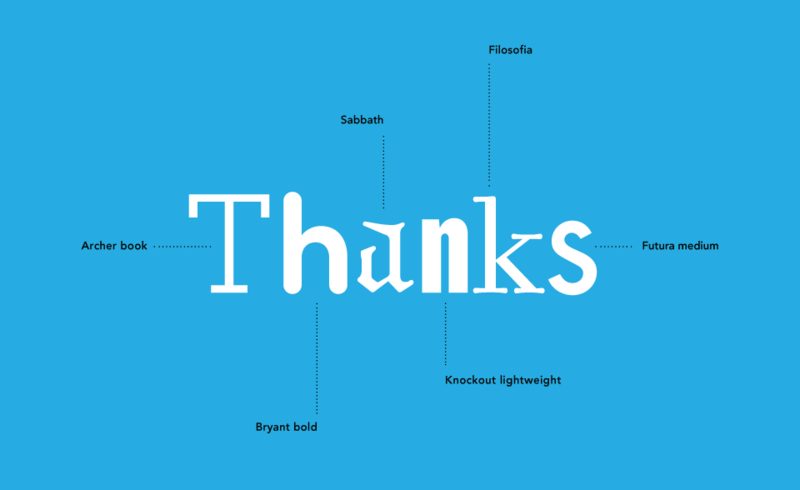 Focusing on what I know and love, I chose typefaces... namely the business of buying and selling type. Problems facing designers and other type consumers is that quality tyefaces are often expensive and finding new and interesting fonts and type foundries can be time-consuming. Problems facing small type foundries and type designers are gaining market awareness, fighting font piracy and increasing revenue. 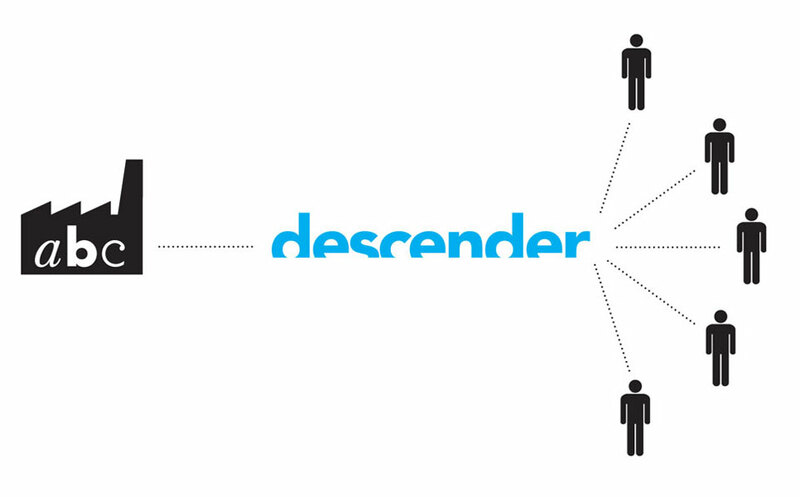 My solution was descender, a service that brings together typeface buyers and typeface foundries for mutual benefit. Quickly described as Groupon for fonts, descender harnesses the power of group-discounted purchasing within a limited time frame to market new foundries and typefaces to the widest possible audience. 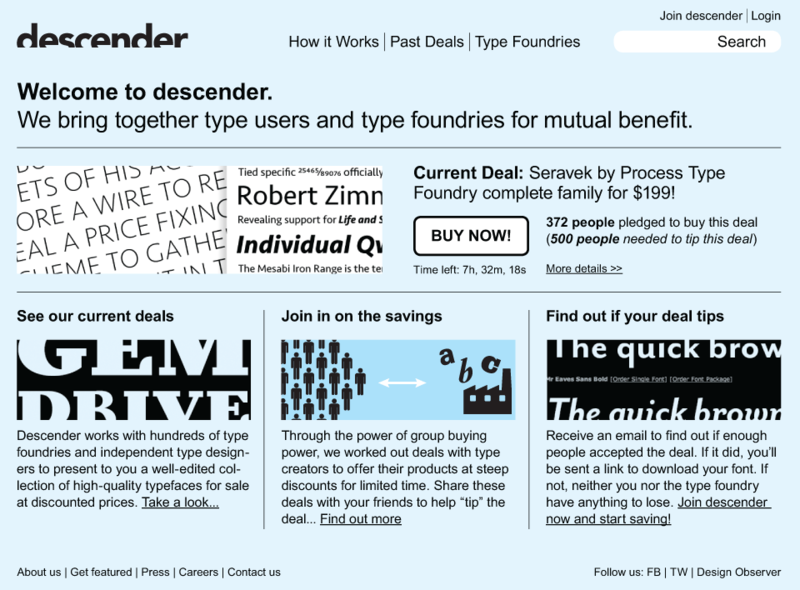 Type foundries advertise a font of their choice on descender at a discounted price for a limited time. Then a pre-determined number of people need to accept the deal to make it happen; there is nothing to lose if the deal doesn’t go through. descender’s innovation lies in applying Groupon’s volume discount and assurance contract formula to a single type of niche product using by a specific target audience. It also creates a new pricing model and distribution channel for buying & selling typefaces, which is also competition for existing type resellers. In addition to analyzing the market and competitive landscape, the team required to build this service was described as well as how investor money would be spent. Wireframes illustrating each step of descender’s process were created detailing the simplicity and ease-of-use for this minimal viable product.